This tutorial will review the process of making announcements on your vBulletin website. This is a good feature that will allow you to inform your users about any news that you may have for them about your forum. In order to manage the announcements on your website, you need to access the Admin area of your website. To create a new announcement, simply navigate to the Announcements option on the left-side menu and then Post New Announcement. When you are ready with the setup of the new announcement, simply click on the Save button at the bottom-right corner of the screen. To remove an existing announcement on your website, you need to navigate to the Announcements option on the left-side menu and then Announcement Manager. You will be presented with a list of the channels on your website and the announcements being configured at the moment. To remove an announcement, simply click on the Delete button next to it. 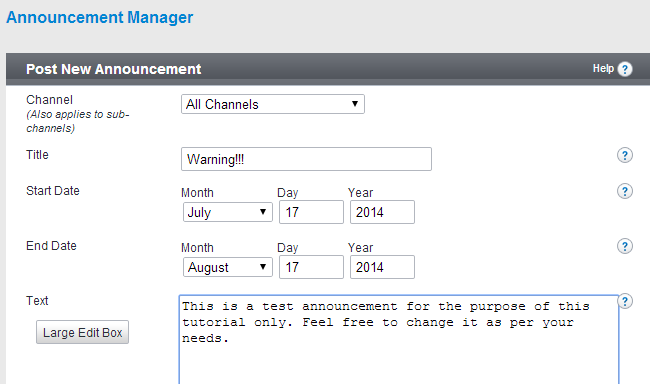 You now know how to manage the announcement feature in vBulletin. Congratulations!